How to forward email without adding fw before subject in Outlook? Kutools for Outlook: 100+ New Advanced Tools for Outlook. Classic Menu: Bring Old Menus and Toolbars Back to Office 2007, 2010, 2013, 2016 and 2019. 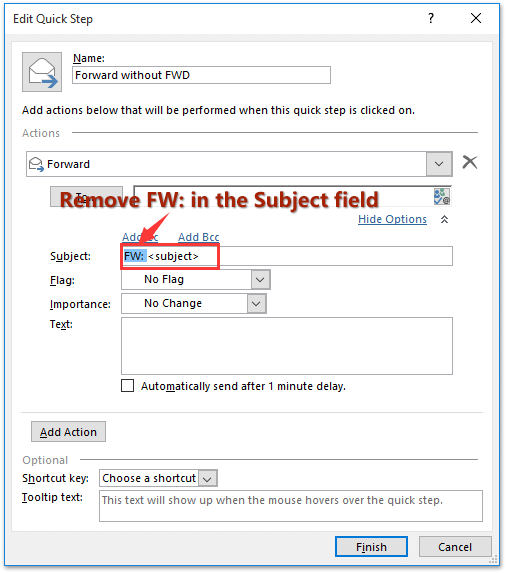 This method will guide you to forward an email without adding FW: before subject with the Resend This Message feature in Outlook. 1. In the Mail view, double click to open the email you will forward without FWD. 3. Now a warning dialog box pops out. Please click the Yes button to go ahead. So far, the email has been forwarded without adding FW: before subject. After sending, please close the original message. 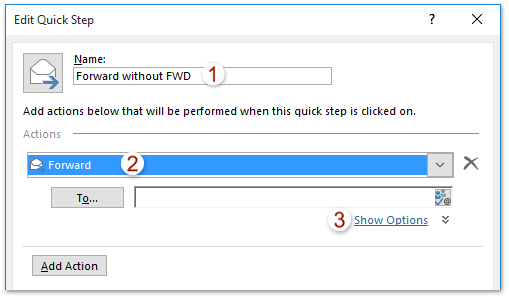 This method will guide you to create a custom quick step to forward emails without adding FW: before subjects of forwarding emails in Outlook. 5. Compose the forwarding email and send it.